Bāburnāma (Chagatai/Persian: بابر نامہ‎;´, literally: "Book of Babur" or "Letters of Babur"; alternatively known as Tuzk-e Babri) is the name given to the memoirs of Ẓahīr-ud-Dīn Muhammad Bābur (1483–1530), founder of the Mughal Empire and a great-great-great-grandson of Timur. It is an autobiographical work, written in the Chagatai language, known to Babur as "Turki" (meaning Turkic), the spoken language of the Andijan-Timurids. According to historian Stephen Frederic Dale, Babur's prose is highly Persianized in its sentence structure, morphology, and vocabulary, and also contains many phrases and smaller poems in Persian. During Emperor Akbar's reign, the work was completely translated to Persian by a Mughal courtier, Abdul Rahīm, in AH 998 (1589–90). 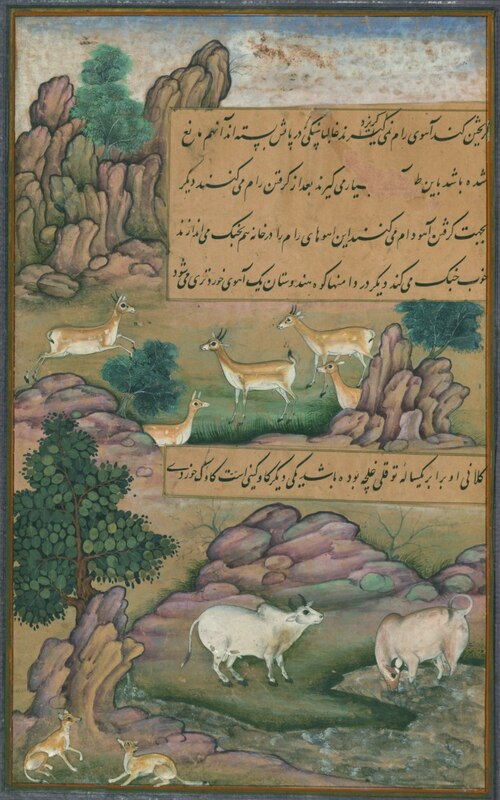 Illustrations in the Baburnama regarding the fauna of South Asia. 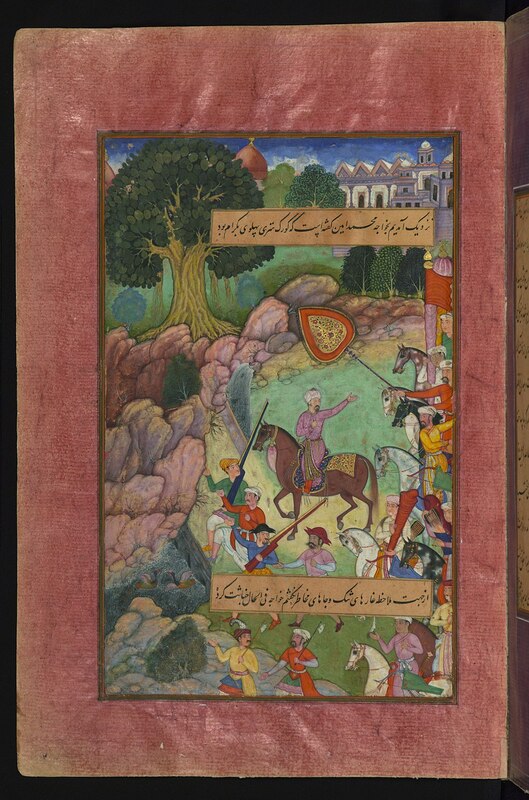 An image of Rhino hunt from Baburnama. Bābur was an educated Timurid and his observations and comments in his memoirs reflect an interest in nature, society, politics and economics. His vivid account of events covers not just his own life, but the history and geography of the areas he lived in as well as the people with whom he came into contact. In the month of Ramadan of the year 899 and in the twelfth year of my age, I became ruler in the country of Farghana. After some background, Bābur describes his fluctuating fortunes as a minor ruler in Central Asia – he took and lost Samarkand twice – and his move to Kabul in 1504. There is a break in the manuscript between 1508 and 1519. By the latter date Bābur is established in Kabul and from there launches an invasion into north-western India. The final section of the Bāburnāma covers the years 1525 to 1529 and the establishment of the Mughal empire in India, which Bābur's descendants would rule for three centuries. Widely translated, the Bāburnāma forms part of textbooks in no fewer than 25 countries – mostly in Central, Western, and Southern Asia. It was first translated into English by John Leyden and William Erskine as Memoirs of Zehir-Ed-Din Muhammed Baber: Emperor of Hindustan and later by the British orientalist scholar Annette Beveridge. His autobiography is one of those priceless records which are for all time, and is fit to rank with the confessions of St. Augustine and Rousseau, and the memoirs of Gibbon and Newton. In Asia it stands almost alone. his Memoirs are no rough soldier's chronicle of marches and countermarches...they contain the personal impressions and acute reflections of a cultivated man of the world, well read in Eastern literature, a close and curious observer, quick in perception, a discerning judge of persons, and a devoted lover of nature; one, moreover, who was well able to express his thoughts and observations in clear and vigorous language.The shrewd comments and lively impressions which break in upon the narrative give Babur's reminiscences a unique and penetrating flavour. The man's own character is so fresh and buoyant, so free from convention and cant, so rich in hope, courage, resolve, and at the same time so warm and friendly, so very human, that it conquers one's admiring sympathy.The utter frankness of self-revelation, the unconscious portraiture of all his virtues and follies, his obvious truthfulness and fine sense of honour, give the Memoirs an authority which is equal to their charm. If ever there were a case when the testimony of a single historical document, unsupported by other evidence, should be accepted as sufficient proof, it is the case with Babur's memoirs. No reader of this prince of autobiographers can doubt his honesty or his competence as witness and chronicler. He was occupied at this time in linking in narrative form the jottings which he had made throughout his life as a rough diary, but he also found time for a magnificent and very detailed forty page account of his new acquisition—Hindustan. In it he explains the social structure and the caste system, the geographical outlines and the recent history; he marvels at such details as the Indian method of counting and time-keeping, the inadequacy of the lighting arrangements, the profusion of Indian craftsmen, or the want of good manners, decent trousers and cool streams; but his main emphasis is on the flora and fauna of the country, which he notes with the care of a born naturalist and describes with the eye of a painter...He separates and describes, for example, five types of parrots; he explains how plantain produces banana; and with astonishing scientific observation he announces that the rhinoceros 'resembles the horse more than any other animal' (according to modern zoologists, the order Perisodactyla has only two surviving sub-orders; one includes the rhinoceros, the other the horse). In other parts of the book too he goes into raptures over such images as the changing colors of a flock of geese on the horizon, or of some beautiful leaves on an apple tree.His progression with all its ups and downs from tiny Ferghana to Hindustan would in itself ensure him a minor place in the league of his great ancestors, Timur and Jenghiz Khan; but the sensitivity and integrity with which he recorded this personal odyssey, from buccaneer with royal blood in his veins revelling in each adventure to emperor eyeing in fascinated amazement every detail of his prize, gives him an added distinction which very few men of action achieve. The first Mughal Emperor Babur. ^ Dale, Stephen Frederic (2004). The garden of the eight paradises: Bābur and the culture of Empire in Central Asia, Afghanistan and India (1483–1530). Brill. pp. 15, 150. ISBN 90-04-13707-6. ^ "Biography of Abdur Rahim Khankhana". Archived from the original on 2006-01-17. Retrieved 2006-10-28. ^ Bābur (Emperor of Hindustān) (1826). Memoirs of Zehir-Ed-Din Muhammed Baber: emperor of Hindustan. Longman, Rees, Orme, Brown, and Green. Retrieved 5 October 2011. ^ Babur (1922). Beveridge, Annette Susannah, ed. The Babur-nama in English (Memoirs of Babur) - Volume I. London: Luzac and Co. Retrieved 14 December 2017. ^ Babur (1922). Beveridge, Annette Susannah, ed. The Babur-nama in English (Memoirs of Babur) - Volume II. London: Luzac and Co. Retrieved 14 December 2017. ^ a b Lane-pool, Stanley. "Babar". p. 12–13. Retrieved 12 June 2015. ^ Gascoigne, Bamber (1971). The Great Moghuls. London: Jonathan Cape; New York: Harper & Row. pp. 37–38, 42. Events from the year 1530 in India. Al-aman (1528 – ?) was a Mughal prince as the eldest son of the Mughal Emperor Humayun and his first wife and chief consort Bega Begum.Al-aman Mirza was born in Badakshan, present-day Afghanistan, and was his father's first child and eldest son. Upon the prince's birth, his grandfather, the Emperor Babur, heavily congratulated Humayun and his wife, but criticized the couple for naming the child 'Al-aman', a name which, according to him, was grammatically incorrect and ominous in its connotation. Babur commemorated the birth of his first grandson both by mentioning it and by preserving his own congratulatory letter to Humayun in his memoir, the Baburnama.Being the Emperor's eldest son, Al-aman Mirza was the heir-apparent to his father but died in childhood. Nawab Malik Amir Mohammad Khan (1910 – 26 November 1967) also known as Nawab of Kalabagh (نواب کالا باغ) was a prominent feudal lord, politician and the chief of his tribal estate Kalabagh, in Mianwali District of north western Punjab, Pakistan. An autobiography (from the Greek, αὐτός-autos self + βίος-bios life + γράφειν-graphein to write) is a self-written account of the life of oneself. The word "autobiography" was first used deprecatingly by William Taylor in 1797 in the English periodical The Monthly Review, when he suggested the word as a hybrid, but condemned it as "pedantic". However, its next recorded use was in its present sense, by Robert Southey in 1809. Despite only being named early in the nineteenth century, first-person autobiographical writing originates in antiquity. Roy Pascal differentiates autobiography from the periodic self-reflective mode of journal or diary writing by noting that "[autobiography] is a review of a life from a particular moment in time, while the diary, however reflective it may be, moves through a series of moments in time". Autobiography thus takes stock of the autobiographer's life from the moment of composition. While biographers generally rely on a wide variety of documents and viewpoints, autobiography may be based entirely on the writer's memory. The memoir form is closely associated with autobiography but it tends, as Pascal claims, to focus less on the self and more on others during the autobiographer's review of his or her life.See also: List of autobiographies and Category:Autobiographies for examples. Bangermau is a town (Tehsil) and a municipal board in Unnao district in the state of Uttar Pradesh, India. It is about 49 km north-west of Unnao and 22 km north-west of Safipur on the Unnao-Hardoi road. Bangermau is a very old town situated on left bank of river Kalyani, a tributary of Ganga. It is a central point for local agriculture trade which serves nearby villages as a main market. It is now a big tehsil of District Unnao. Bangermau is connected to Delhi via Agra Lucknow Expressway (475 km), Lucknow (65 km), Kanpur (70 km) (connected with railine Balamau to Kanpur), Unnao (50), Hardoi (65), Bareilly (197) by highways. There is a degree college named Indra Gandhi Government PG College. This college was established by the efforts of late Shri Pt. Gopi Nath Dixit, Home Minister of Uttar Pradesh, for providing higher education to rural and areas in July 1988. The college is situated at the Kanpur- Hardoi state highway. It is 50 km away from Unnao headquarters. It provides education in Arts, Science and Commerce. Post-graduation classes also started from 1998-99 in three subjects: Hindi, Sociology and Economics. There is a very old temple named Baba Bodheswar situated west of the town. Bangermau is a pilgrim center, mentioned in U.P. Tourism Dept. A Tantrik temple, Raj Rajeshwari Mandir, was established 200 years ago. Near Bangermau is Sanchan Kot, where a recent Archaeological Survey of India excavation unearthed a 2000 year old Shiva temple. The town is also referred to in Baburnama biography of Babar where Babar mentioned that on 15 March 1528 he camped near a lake situated in Bangermau and the next day left for Lucknow. Bangermau also has the Raj Rajeshvari temple. Bangermau comes in the area of influence of the Sufi Saint Madar Shah of the Madaria sect. There are several villages named after him, situated around Bangermau. Baqi Tashqandi, also known as Mir Baqi, was a Mughal commander (beg) originally from Tashkent (in modern Uzbekistan) during the reign of the first Mughal emperor Babur. He is widely believed to have been made the governor of the province of Awadh. He is believed to have founded Babri Mosque in Ayodhya in 1528, which later became the focal point of the Babri Masjid–Ram Janmabhoomi dispute. However, the historical evidence for these beliefs is scant. The Flag of Hazaristan (Dari/ Hazaragi : پرچم هزارستان) includes three colors: yellow, white and blue. It was originally presented on the cover of the anthology Poems for the Hazara. Hazaristan is a modern incarnation of Hazarajat, a mountainous region in central Afghanistan, in the Hindu Kush mountain range. Hazaristan is not an independent country, but has been home to the Hazara people since antiquity, first referenced by extant literature (as Turkic Hazarajat) in Baburnama, the Chagatai-language memoirs of Mughal Emperor Babur. The Garden of Babur (locally called Bagh-e Babur, Persian: باغ بابر‎ / bāġ-e bābur) is a historic park in Kabul, Afghanistan, and also the last resting-place of the first Mughal emperor Babur. The garden are thought to have been developed around 1528 AD (935 AH) when Babur gave orders for the construction of an ‘avenue garden’ in Kabul, described in some detail in his memoirs, the Baburnama. It was the tradition of Moghul princes to develop sites for recreation and pleasure during their lifetime, and choose one of these as a last resting-place. The site continued to be of significance to Babur’s successors, Jehangir and his step-mother, Empress Ruqaiya Sultan Begum (Babur's granddaughter) made a pilgrimage to the site in 1607 AD (1016 AH) when he ordered that all gardens in Kabul be surrounded by walls, that a prayer platform be laid in front of Babur’s grave, and an inscribed headstone placed at its head. During the visit of the Mughal Emperor Shah Jahan in 1638 (1047 AH) a marble screen was erected around tomb of his foster-mother, Ruqaiya Sultan Begum, and a mosque built on the terrace below. There are accounts from the time of the visit to the site of Shah Jahan in 1638 (1047AH) of a stone water-channel that ran between an avenue of trees from the terrace below the mosque, with pools at certain intervals. Govardhan (fl. 17th century) was a noted Indian painter of the Mughal school of painting. He was the son of another painter, Bhavani Das. He joined the imperial service during the reign of Akbar and he continued his work till the reign of Shah Jahan. The examples of his work survived till date show that he was fond of rich, sensuous colour and softly modeled forms. Govardhan was one of the illustrators of the Baburnama currently located in the British Museum, London. The Jahangir celebrating the festival of Ab-Pashi (1615), presently kept in the Raza Library in Rampur, India is one of his significant creations. The portraits created by him in the Jahangir albums are presently in the collections of various American and European museums. He depicted the different human physiques of the Indians with much accuracy. An excellent portrait of him was prepared by one of his contemporary painter, Daulat (artist). Isakhel is a sub-tribe of the Pashtun tribe, Niazi. The earliest recorded mention of the isa khel tribe is in Baburnama, 1504-1505. Most of the tribe still resides in their ancestral town of Isakhel, named after their ancestor Isa Khan Niazi, but a lot have shifted to bigger cities or different towns in pursuit of a better education and better opportunities. The Khalil (Pashto: خليل‎) is a Pashtun Ghoryakhel subtribe primarily living in Pakistan with some members in Nangarhar, Herat, Ghazni, Kandahar, of Afghanistan and in the Peshawar Valley. The Khalil's settled to the west and south-west of Daudzai tribe. Khanzada Begum (c. 1478 – 1545) was a Timurid princess and the eldest daughter of Umar Shaikh Mirza II, the amir of Ferghana. She was also the elder sister of Babur, the founder of the Mughal Empire. She and her brother remained deeply attached to each other all their lives, a period during which the family progressed from ruling a tiny and obscure principality in Central Asia to ruling a large portion of the Indian subcontinent. Babur conferred on his sister, the honorable title of Padshah Begum and she was really the first lady of his Empire after his death. Khanzada Begum is frequently mentioned in the Baburnama, her brother's memoirs, and always with affection and respect. She is also frequently mentioned in the Humayun-nama by her niece Gulbadan Begum, who calls her aunt 'Dearest Lady' (aka janam). Many occasions are described where she intervened during political difficulties between her relatives and more specifically her nephews. Sambhal (listen) is a city in Sambhal district of Uttar Pradesh, India. Sambhal district is a district of Uttar Pradesh state in India.The District headquarter is Bahjoi town. The Siege of Samarkand was the third and last campaign against the city by both belligerents. Four years after its recapture by the forces of Babur, there was a rebellion that lost the King of Ferghana his kingdom and his capital. In 1501, Babur and his army felt ready to besiege the city again. However, his invasion attempt was beaten off by Shaybani, an Uzbek tribal chief whose conquests were known across Central Asia. Tuzuk-e-Jahangiri or Tuzuk-i-Jahangiri (Persian: تزک جہانگیری ‎) is the autobiography of Mughal Emperor Nur-ud-din Muhammad Jahangir (1569-1627). Also referred to as Jahangirnama, Tuzk-e-Jahangiri is written in Persian, and follows the tradition of his great-grandfather, Babur (1487-1530), who had written the Baburnama; though Jahangir went a step further and besides the history of his reign, he includes details like his reflections on art, politics, and also information about his family.